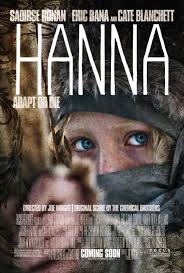 Joe Wright’s 2011 film Hanna presents an extraordinary tale: the titular girl (Saoirse Ronan), trained as an assassin from a young age by her father (Eric Bana), is hunted by government agent Marissa (Cate Blanchett) for unknown reasons. Doesn’t seem very fairy tale-esque on the surface, but if you look closely, you’ll start to notice references Grimm’s fairy tales in everything from books to theme parks to the music (seriously, The Chemical Brother’s “The Devil is in the Details” bears more than a passing resemblence to “Hi Ho, Hi Ho, It’s Off to Work We Go”). Through this lens, you can’t help but wonder which fairy tale Hanna most resembles. And if you’re willing to bear with me, I’d be more than happy to tell you why this is a reimagining of Snow White, and why the fairy tale’s message still holds up. Let’s break down Snow White first. We’re not talking Walt Disney’s classic. I’m talking the story that first showed up in the Brothers Grimm’s 1812 collection. There’s a marked difference between the story Disney told everyone versus the actual tale, and apologies if you haven’t heard this before, for I’m about to break part of your childhood. The tale starts off in the dead of winter, as a queen injures herself during sewing (itself a metaphor for menstruation and pregnancy) and wishes for a beautiful baby girl with red lips, pale skin and black hair. This queen dies in childbirth; her beautiful daughter then goes on to get the frostiest, most self-obsessed stepmother imaginable, who tries to kill the child after her status as the most beautiful woman alive is threatened. The girl is saved from a brutal murder by a huntsman that can’t bring himself to kill her, settling instead upon killing a wild boar (or deer in some instances of retelling) to bring back as proof to the queen. 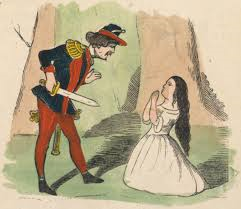 As the queen eats the heart and liver in triumph, Snow White flees into the woods, here she steals the resources of a group of dwarves before being accepted and protected by them. The queen, meanwhile, finds out the ruse of the huntsman and sets out to destroy the competition, finally succeeding with a poison apple. In their grief, the dwarves place her into a glass coffin so that everyone can see her beauty eternally. She’s eventually saved when a prince falls in love with the corpse (sidenote: dah fuq?) and persuades the dwarves to let him have the coffin; en route to his place, the coffin jostles and the poisoned apple dislodges from the girl’s throat, saving her life. It doesn’t end there: the prince marries Snow White, and when the queen travels to their wedding, she has her stepmother placed in a pair of red-hot iron shoes and forces her to dance until she drops dead. Happy, happy, happy. Joy, joy, joy. This doesn’t sound very much like Hanna on the surface; however, it does indeed run parallel in terms of its updated plot, making it an apt adaptation of folk tale. Hanna is raised in the woods after fleeing the government compound in which she was born and raised. Her mother dies in the process, at the hands of Marissa. Her father decides that it’s time for the girl to know her roots, and sets into motion the events of the film: Hanna’s pseudo-capture, her escape from the compound using her honed skills, her chase by Marissa, the discovery of the European family that aids her on her journey. Sound a bit familiar? Hanna also discovers that she’s quite literally a science experiment: her mother was recruited outside of an abortion clinic, and the fetal Hanna was experimented upon as part of a project to create super-soldiers. When the project was canceled, all specimens of the project were purged, leaving only the small child to be raised by her adoptive father to fulfill her birthright. It ends with an injured Hanna killing Marissa in a way that mimics the death of the reindeer at the beginning of the film – shot in the heart with an arrow, then shot in the head with a gun. Thematically, this is missing the prince, but it contains several parallels to the original folk tale: a female child with special abilities that far surpasses a mother figure (though not a literal mother) must use her wits to escape her oppressor, eventually killing her despite injury. Both girls – Hanna and Snow White – are approximately the same age when they undertake their journeys, making the tales a rite of female passage; in essence, it marks the movement from innocent, protected childhood into a more perilous adulthood. Both are a source of shame for their antagonists: Hanna represents a sloppy loose end from Marissa’s failed super soldier project, while Snow White is a reminder of her stepmother’s aging and mortality. Either way, the girls – the younger generation – needs to be destroyed in order to preserve the ego of the previous generation. In that respect, both undeniably outshine the abilities of their mother figure, and must flee the risk of destruction, only to rely heavily upon survival skills and the kindness others after initial deceptions. At the core, they’re representations of the same tale. So why do we need this fairy tale? As with most folklore, the tales change and update to match the anxieties and values of the times, and Hanna is no exception to this concept. Hanna is notably missing Prince Charming, which goes to show you that society is ready for stories wherein our heroines can rescue themselves. Also reflected is a deep concern that one hot-button social issue (abortion) is going to give rise to something far more damaging (genetic experimentation): in saving mother Johanna from aborting her daughter, the girl is used by the government to become a weapon. As more and more scientific advances are made, we’re going to ask ourselves if our causes are going to intersect into a type of bizarre symbiosis: we need to ask if we’re going to feed one cause with the literal body and blood of another cause. That jumps to another issue our society is still exploring: how does a woman manage to accept moving on in her life, particularly aging and adherence to tradition? Marissa wants to possess her weapon, with the intent to kill Hanna if she doesn’t go along with what she says; in the original, the stepmother could not handle the notion of the girl being more beautiful than she, calling into question the need to feed and maintain one’s identity. Both girls struggle against the oppressive generation of women before her, reflecting that the values of the past are not the same as the desire to live and go for future generations. Let’s be blunt: we live in times of upheaval, where one generation’s norms are being actively shunned by the younger generation. This is causing serious clashing between family and society members, to the point of some proclaimingt that others are dead to them. Top this off with a mass of middle-aged women attempting to find value after society tells them that they’ve bourne their babies and are now expendable, and we have a recipe for anxiety related to both age and gender. Hell yes this is relevant. The struggle to survive is a bit like birth here. The recording of fairy tales started as a way to capture not only the language of those that told them, but the thoughts, values and anxieties of the culture as well. Film has now become our new folklore: it captures what makes us afraid, as well as how we address and accept what has been dealt to us. Hanna demonstrates that the fairy tale of yesteryear can indeed be updated to express our own modern anxieties. The devil just happens to be in the details.